In some states in the U.S., non-compete agreements are limited in their reach, and looked upon with disfavor. While the agreements are legal in North Carolina, it is important for an employer to understand common mistakes in non-compete agreements, and the provisions for an enforceable non-compete agreement prior to asking an employee to sign. The following considers these two concerns, as well as the benefits of working with an experienced attorney to ensure your company’s non-compete agreements can achieve your goals. What Is an Employment Non-Compete Agreement? Put simply, an employment non-compete agreement or non-compete clause is a stipulation in an employment contract which states that the employee is barred from entering a similar profession or trade that is in competition with the contract holder (current employer). In other words, a non-compete agreement can bar an employee from working for another company within the same industry after the employee leaves the employer. Typically, non-compete agreements set a six-month to two-year timeline (from the date that the employment contract is terminated) prohibiting competition, although this can vary based on the specific contract. These types of contracts are beneficial to employers because they legally forbid an employee from sharing trade secrets, business strategies, etc. with another company. Not putting the agreement in writing. 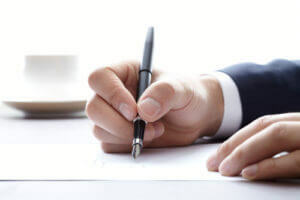 While verbal agreements may be upheld in court in certain circumstances, it is essential that an agreement be made in writing and signed by both parties. Failing to base the non-compete agreement on valuable consideration. In this context, consideration means that the employer made an already-hired employee sign a non-compete agreement without exchanging anything of value. It is best to have new employees sign non-compete agreements as part of their initial employment contracts, and to make sure that the employer is offering something valuable (like compensation, benefits, etc.) in return. Failing to set a reasonable amount of time. If a non-compete agreement restricts an employee from working for a competitor for an amount of time that seems unreasonable, the agreement may be considered invalid. Failing to set a reasonable territory. Similar to a reasonable amount of time, a non-compete agreement may be rendered invalid if it restricts an employee from seeking employment in a territory that is considered unreasonably expansive. For example, while it makes sense for a non-compete agreement to apply to businesses within a single city, restricting that to multiple states may excessive. See CopyPro, Inc. v. Musgrove, summarized in JD SUPRA Business Advisor, for a look into how the North Carolina Court of Appeals recently ruled in regards to these two unreasonable items (and others) regarding an employee’s breach of a non-compete clause. Too often, companies – especially small businesses without legal representation – make preventable mistakes when drafting employee non-compete agreements. At The Armstrong Law Firm, P.A., our business attorneys are ready to draft or review all of your employee agreements. Contact us today to find out how we can help. The Armstrongs mean it when they say they are trial lawyers who are ‘Strong for You’. Simply put they are not afraid of the courtroom, if that’s what it takes to get justice. That is what it took for my case, and I am very thankful they stood strong all the way through the jury’s verdict and saw justice through.